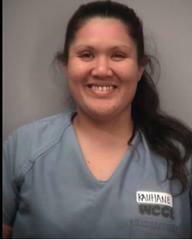 Missing WCCC extended furlough inmate Momi Kauhane-Malrey turns herself in to State Sheriffs. She faces an added escape charge. Missing Women’s Community Correctional Center (WCCC) extended furlough inmate Momi Kauhane-Malrey voluntarily turned herself in to Sheriffs last night. At approximately 9:30 p.m. she was returned to WCCC. On Saturday, Momi Kauhane-Malrey left the YWCA Fernhurst furlough home where she resides. She was not authorized to leave the home. 33-year old Kauhane-Malrey is classified as community custody which is the lowest custody level. She is serving time for Promotion a Dangerous Drug 3 and Prohibited Acts Related to Drug Paraphernalia. Her parole was tentatively approved with a release date pending approval by the Hawaii Paroling Authority. She now faces an additional escape charge.